A rendering of "The Sunbather" planned for Jackson Avenue. LONG ISLAND CITY — The City Council passed a bill Thursday that will require public hearings before some public art projects can be installed. The legislation was introduced by Councilman Jimmy Van Bramer earlier this year after outcry over a plan to erect a pink sculpture on Jackson Avenue and 43rd Avenue under the Department of Cultural Affair's Percent for Art program. Some criticized the piece and its $515,000 price tag, spurring the councilman to draft a bill that would require plans for Percent for Art pieces be presented at a public hearing or community board meeting so residents can weigh in. "My bill aims to enhance the Percent for Art program by giving New Yorkers the ability to have a greater role in selecting public art projects that truly reflect the diversity of our city," the councilman said in a statement. Percent for Art was started in 1982 and requires a portion of funds for some city construction projects be used on public art pieces. The guidelines for the program already require projects to be presented to local community boards before they're installed, according to a DCA spokesman. But Van Bramer's bill legally mandates the public hearings, requires the city to notify the public in advance about it's plans and advertise public meetings at least two weeks before they take place. 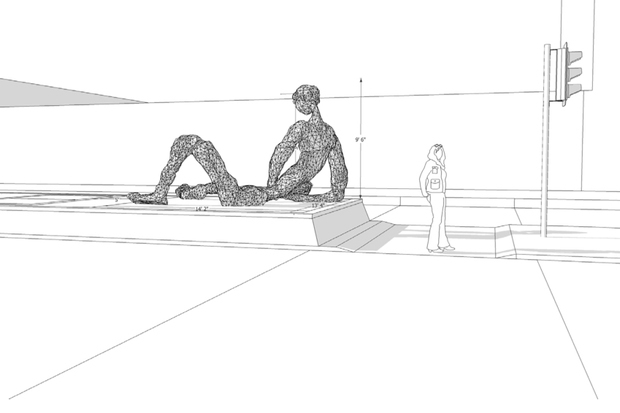 The city is planning to erect the pink sculpture of a reclining man, titled "The Sunbather" by Brooklyn artist Ohad Meromi, on Jackson Avenue with funds allocated from a streetscape improvement project nearby. The piece — which drew both praise and some negative feedback, particularly about its color — is expected to be installed next year, officials said previously. The bill still needs to be signed by the mayor before it becomes law.